We had such a delicious lunch at the Khyber Pass Afghani Restaurant that I wanted to try to recreate it at home. 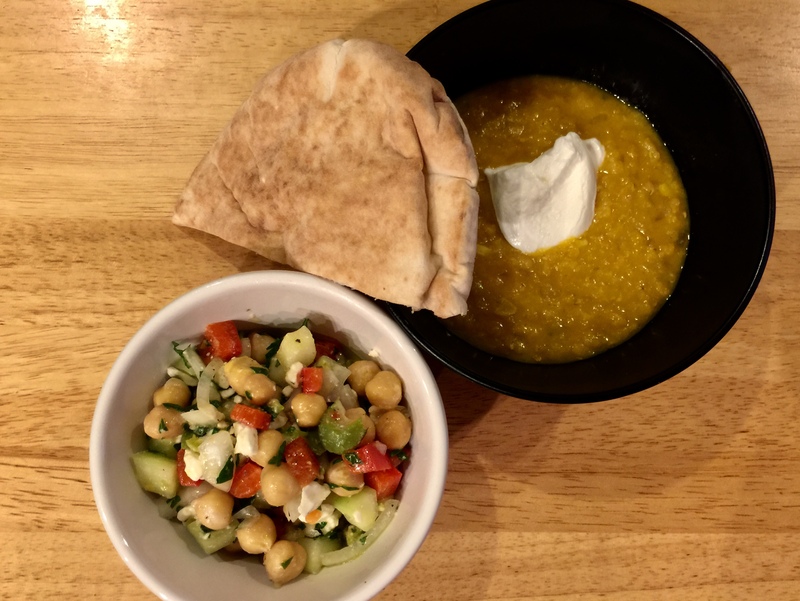 Seems like there are a lot of different spellings for lentils-dal, dahl, daal- that I am just sticking with “lentils.” Our dinner consisted of the lentils, a yummy Mediterranean chickpea salad of chickpeas, feta, onions, and cucumbers (https://www.delish.com/cooking/recipe-ideas/a19885314/mediterranean-chickpea-salad-recipe/) and some warmed pita. The lentils are super easy to make and you can find the recipe I used at http://www.afghancultureunveiled.com/humaira-ghilzai/afghancooking/2010/01/dal-afghan-soul-food.html. Next time I would cut back a little on the ginger and add some butter or oil but these lentils were so good! My rule of thumb is to always make a recipe I find on the internet, in a cookbook, or a magazine exactly as stated the first time. Then on my printout of the recipe I make notes about how I would improve it (for my taste) the next time I make it. This entry was posted in Kitchen tips, Legumes, Vegan, Vegetables, Vegetarian and tagged chickpeas, cucumbers, lentils, red lentils, Vegan, vegetarian. Bookmark the permalink.